After years of reporting on the People for the Ethical Treatment of Animals (PETA), you’d think the organization might show some true remorse about the thousands of cats and dogs it kills at its headquarters and try to make some changes. Instead, it’s doubling down. The animal “liberation” group kills up to 97 percent of dogs and cats in its so-called animal shelter in any given year, and PETA is now calling on local governments—most recently in Arizona—to adopt its philosophy of “better dead than fed” by systematically killing feral cats. Feral cats, formerly domestic cats that set up colonies in communities, tend to breed like rabbits, causing crowding or a strain on resources at animal shelters. Many communities use a program to trap, neuter, and return—also known as TNR—feral cats as a means of population control without killing. A county in Arizona recently implemented such a plan. You’d think that a group that thinks chicken farms are Auschwitzes (literally) would be on board with this, but no. In fact, PETA favors whacking each and every feral cat in Pima County and across the United States. Apparently a series of mass kitty executions is the “ethical” solution to population problems. 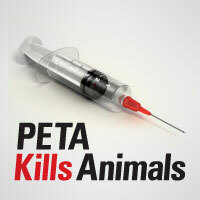 But then again, PETA has killed more than 33,000 animals since 1998. But this is certainly escalation: There are an estimated 50 million feral cats in the U.S.
Perhaps PETA should be “put down” instead. Sign our petition to take away PETA’s tax-exempt status and show the group that it should be held accountable for its actions. PETA has killed tens of thousands of animals since 1998 and we're making sure the whole world knows. Have a tip or something else we should know? Get in touch on our contact page.